I absolutely love the idea of red letter days! (Who needs more black letter days, right? Ha ha!) The birds perfectly capture the intent, and what a wonderful way to end the month! What a brilliant mini quilt, and I am so glad that it moved you to happy tears. What lovely quilt and background story It has a joyful/whimsical feeling to it and not at all sad. This quilt is so amazing on many levels. I agree that improv connects you to a quilt that is missing in a just follow the pattern kind of creation. The quilting adds so much depth and texture to the design. I just really really love your entry! 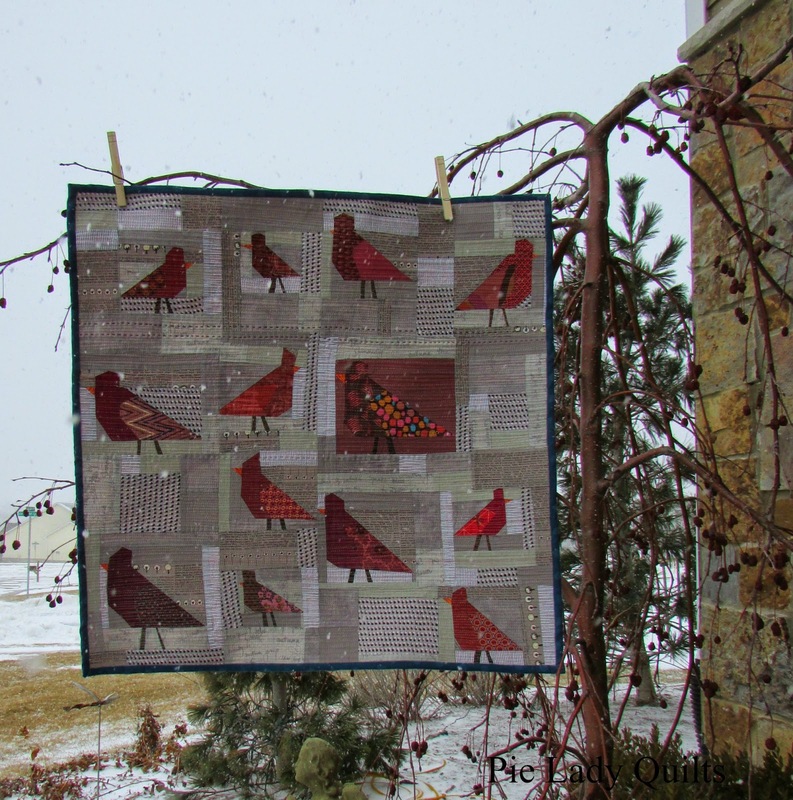 This is an awesome little quilt, I love the free-pieced background and that the birds are all different but similar. 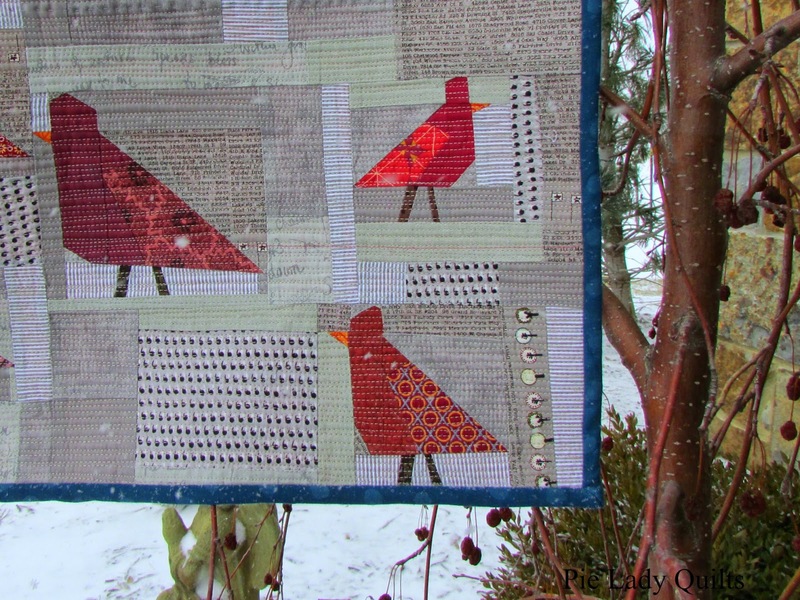 Such a moving blog post and a stunning quilt. February has too many emotions. I know. I find that art becomes an expression of words that pool in my mind with no release. Your quilts are beautiful art works. They speak volumes of words. As does your art, Maria. Someday we should do a painting/quilt swap! I love your post. I had a black letter day, and the picture of me that little bird made me cry. And then I finished reading your post, and looking at your quilt, I smiled too. Thanks for sharing your quilt and life with is. Gosh it looks so much bigger in the photos, and its definitely not one bit sad. I really like this and love the background with the Marsala. Feb and November are miserable months for sure but at least there is pancake tuesday and happily spring is on the way - it must be by now! Wow I felt so like that little bird the other day, and you post was so where I was at, and the quilt just brightened my day. Everyone has been complaining about the Marsala, but I think that you did wonders with it. Great quilt, and love your quilting. I am sorry about your bad day. I am not trying to be cavalier, but focusing on the bright spots really seems to help, doesn't it? Here's to better days and more red birds! I totally love, love, love your quilt! May many red letter days be in your future! This is my favorite Marsala quilt I have seen! Love the quilt and the meaning! This is beautiful. Thanks so much for sharing this quilt and your story behind it with us. I was really touched by your writing and by this beautiful quilt. Thanks for the tutorial as well. 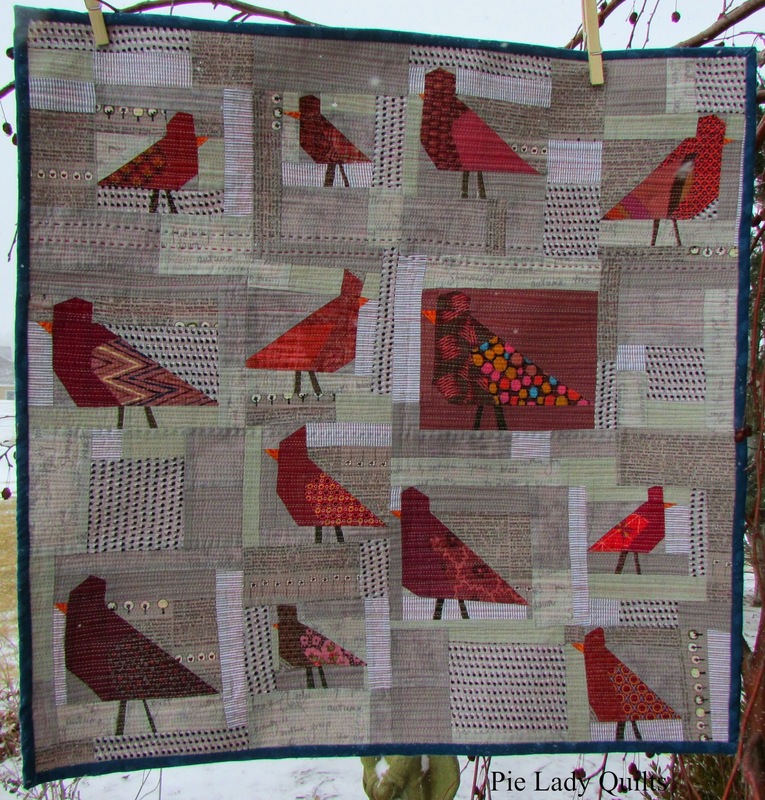 I have seen a similar bird quilt and wondered how it was done. Thank you, Lisa. To me, the quilt is only part of a story. I am glad the tutorial was useful for you. I hope you give the birds a try. They are incredibly addictive and fun! This is really beautiful and what you have written is lovely too. I particularly like how you have quilted it, mixing weights of thread and colour is very effective. This is fabulous. I love how you weave life into your writing and your art. I should have added you to bloglovin when I found you a few weeks ago with your hogarth curve quilt ~ I'm going to remedy that and add your blog right now! 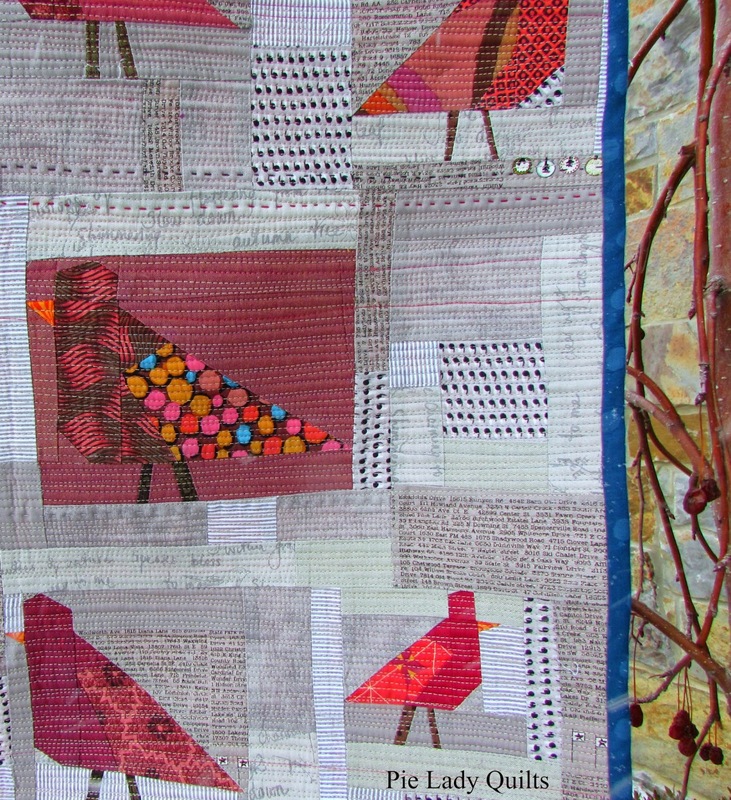 I love your redbird quilt. Such lovely composition and color! Your birds are adorable. I love the low volume background too- adds so much depth to the quilt. Thank you, Lynn. I was happy that I had so much of the background fabric left. I can see myself doing something like this again. What a gorgeous combo of colors. Love the placement as well. And the teal binding is just the right element of contrast! I hope you enjoy this quilt for years to come! I once heard someone say that when you have doubts about binding color, to always use Kona curry. I guess teal is my default color! Thank you for sharing this quilt, it is lovely. Thank you. I dearly love cardinals. Our neighbor has a beautiful hand made bird feeder that has finally coaxed the cardinals out. I heard one singing all afternoon yesterday. I really love this quilt! Not only is is just beautiful, but the story that goes with it makes it so very special. Really, really beautiful work! Thanks! I hung this one up in a place that I can see it many times during the day so it can remind me to smile. I am glad it worked for you, too! Beautiful story and quilt. The birds are so well balanced with the colors against the low volume and the sizes of birds you distributed in the piece. Your quilting is beautiful; the way the matchstick plays off the heavy hand stitching is a favorite look that I have a hard time replicating myself. Thank you Terri Ann. I always seem to want to quilt heavily...probably because it is a favorite look of mine, too. I love how the quilting almost disappears when I add more. This is an incredibly beautiful quilt. I love everything about it. Thank you for the tutorial and the inspiration. The Lovely Woods quilt is equally stunning. I am going to try my hand at some of those birds. Your photography is amazing, too. Thanks for the inspiration! Thank you, Claire! I do hope you try out the birds. Someone else tried them and tagged me on IG. It. Made. My. Day!! Beautiful, and the story behind this makes it that much better! Thanks Heidi! When I was a little girl, my mom and dad would listen to Paul Harvey on the radio every day. Maybe that's where my love for the "rest of the story" comes from. I am glad you enjoyed reading the story. 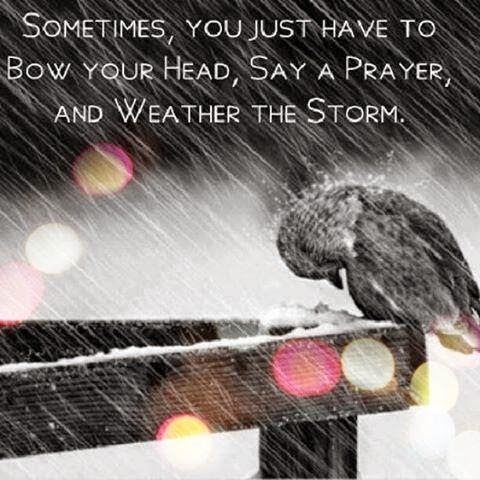 I love your improv birds and how they are happily weathering the storm. What a special quilt and story behind it, thank you so much for sharing! And a beautiful quilt as well. Thank you Anne. I was happy to have an excuse to make it. Challenges in life AND quilting help us grow. Thanks for hosting such a fun event. I have just found your blog and this post was the first I have read. 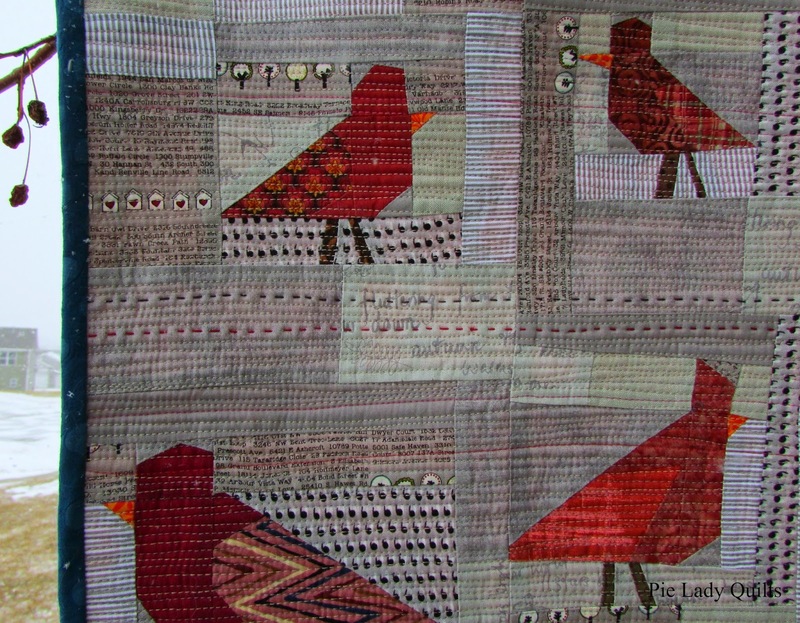 Just wanted to say this is a stunning quilt, I love your birds, fabric colours and the texture of the stitching. Thank you for sharing your thoughts and feelings that make up the story of this quilt. I am looking forward to reading thru your older posts to see what else you have made. from Jenny in Australia. Thank you, Jenny! This is one of my favorite quilts, so I am glad that you started here. I hope you find something else that you like. What a special quilt! I love everything about it! Thank you, Liz. This one hangs in a spot in our house where I can see it often. I like the quilt, but I like what it tells me even more. How I love this blog post! The photos and the text, just wonderful. The quilting is so interesting! I surely want to make something similar. Have you seen my two birds at my blog www.lappetausa2.blogspot.com or at instagram (elgrov)? I want to make a whole flock! Thanks a lot for the inspiration. Thank you, Elin! This quilt is hanging in the stairway of my home and I get to look at it every time I head to the lower level. I enjoy the view. I have seen the beginning of your sweet flock on Instagram. I'm sure your version will be great! Hi, Fran! I am glad to hear that you tried the birds. I hope you are happy with the result. As far as quilting goes, if it is a mini, I would densely quilt it. It sounds crazy, but the more quilting you add, the less the quilting shows. It just becomes a texture in the background. Even if the birds are different colors, it could still work. If it is a larger quilt, your idea with pearl cotton sounds good. My default quilting pattern is usually straight lines. I think either method could work well.